I actually wrote this post back in April, set it aside to get photos for it, and promptly forgot all about it. I dug it out today because I wanted to tackle this saddle again, and have pulled it apart, not realising I never got around to taking photos. So please excuse the fact that there are a whole two photos for this post! 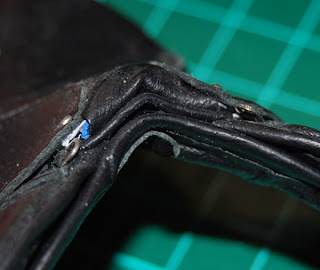 A couple of weeks after I completed my first English saddle back in April, I started working on my second English saddle from the KeriOkie book - a classic sized one. The book provides reduction percentages for different scales, so for this saddle, I used the C1 (classic 1) ratio for this pattern, which the book classifies as being for 'models Breyer classifies as Traditional that are, in fact, a size between Traditional and Classic models, such as Scamper. Also for some of the Traditional Size ponies. C1 is 75% of T1 [the full-size pattern in the book] - reduce by 25%'. 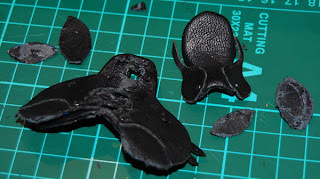 As I started to get into cutting out the pieces, I began to wonder if I would have the same issues I had with my first saddle - the flaps being too small but the seat being the correct length. For me personally, that's not so bad, as I have several 'small classics' in need of English saddles! As much as I was itching to start modifying the pattern and the process and making changes, I figured I should at least make one saddle in classic by the book, so I can see if any of the steps need to be dropped. I did make several small changes though. Going on my thoughts in my last post, I discarded using the aluminium soft drink can for the seat in favour of using the 0.016" metal sheet. (This is the same stuff I use for the tree of my racing saddles.) Immediately I could feel different - it's a lot stronger and is able to put up with a lot more movement when gluing on pieces. You can see the different in made in the seat shape, too - there's actually a seat there now! I used some of the skiver that I got from that lot earlier in the year for the seat and knee rolls, instead of skived-down roo like I did for my first saddle. This stuff is REALLY grainy compared to the roo! 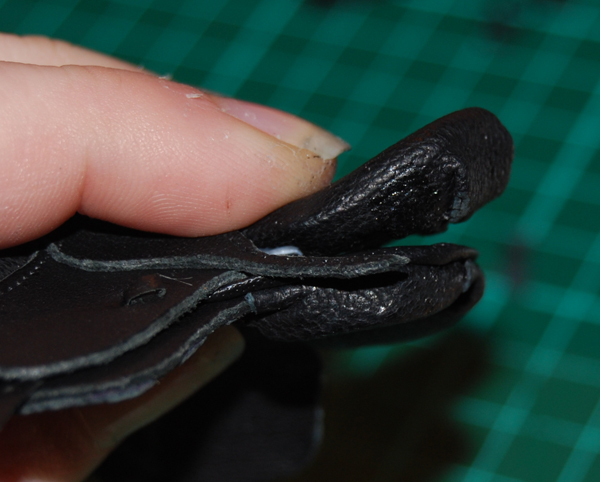 My roo leather has a very tight grain that's almost invisible compared to this skiver. 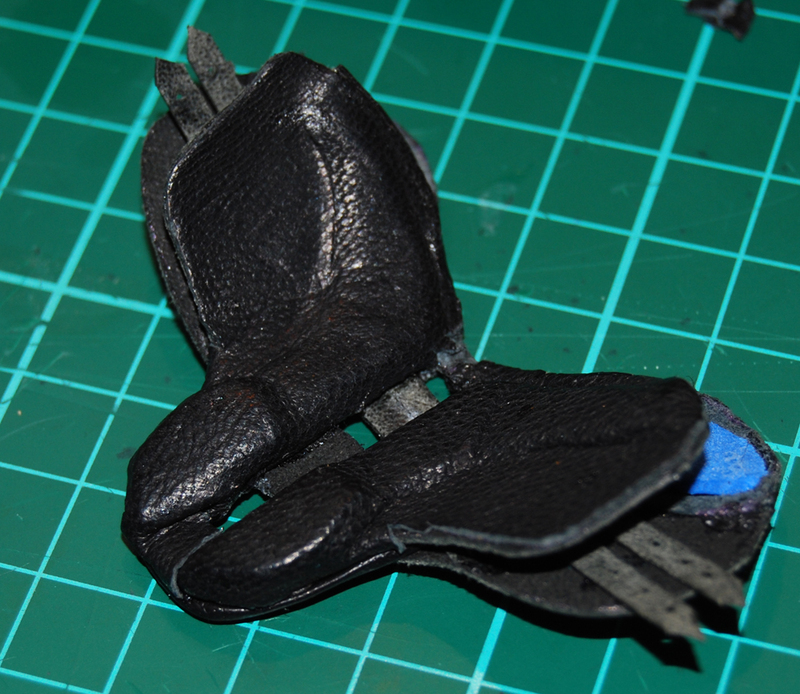 It's also thicker, and unfortunately doesn't skive, so will probably only be good for lining things like girths. The grain also seems to be affected by stretching the leather. Take a look at this photo of the underside panels. The grain on one side is definitely larger. 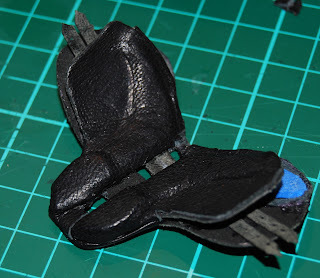 The smaller side is where the leather has been stretched out more. Pretty interesting - but also super annoying! The instructions on these saddles call for two front prongs to slot into the skirt. I had a lot of trouble getting these to sit neatly in the first saddle, so I decided I cut them off the classic tree, thinking this would make assembly easier for me. Bad idea! When it came to assembly time, the seat didn't sit neatly on the rest of the saddle, but rather floats above it (not helped by the thick skiver at the back bulking everything up). One of the other major beefs I have with this mostly-finished saddle is the amount of junk in the pommel. I've since pulled this saddle apart somewhat and don't have a photo, but the traditional saddle is fairly similar. The instructions call for piping trim everywhere, but in small pieces, as opposed to the one or two long pieces found on real saddles. But instead of just dumping this saddle and starting again, I'm going to try and rescue it. This is what the saddle looks like right now. I've pulled off the seat off the saddle, removed the piping trim on the upper skirt, the trim from inside the pommel gullet, trimmed a piece out of the piping that goes around the front of the lower skirt, and cut out a piece from the very front section of the upper skirt, between the front dee-rings, to try and remove some of the bulk. My plan is to make one long strip of piping, and run it along the front of the knee panels, up to the pommel and down the other side.